Louis Adamic's short history of the Knights of Labor union and some of its key disputes from its founding in 1869 until its successful railway strike of 1885. The most important labor bodies in the US in the 1860s were certain secret societies whose initiation rites were absurd, fantastic ceremonials conducted by magniloquent officers with high-sounding titles, and whose members recognized one another by elaborate signs and secret passwords. Of these, the most significant was the Noble Order of the Knights of Labor, founded in 1869 by a Philadelphia garment-cutter, Uriah S. Stephens, and six of his fellow craftsmen. Stephens has been described as "a man of great force and character … with love of books … and feeling withal a strong affection for secret organizations, having been for many years connected with the Masonic order." He had associated with radicals, some of them German refugees of 1848, and from them had acquired a: few vaguely Socialistic ideas that fitted into his natural but even vaguer humanistic idealism. The principles of the K. of L. were set down by Stephens in the secret ritual. "Open and public association having failed after a struggle of centuries to protect and advance the interest of labor, we have lawfully constituted this Assembly," and, "in using this power of organized effort and co-operation, we but imitate the example of capital heretofore set in numerous instances"; for, "in all the multifarious branches of trade, capital has its combinations, and, whether intended or not, it crushes the manly hopes of labor and tramples poor humanity into the dust." The K. of L., however, meant-timidly, carefully-"no conflict with legitimate enterprise," whatever that was, and "no antagonism to necessary capital." It meant, rather, "to create a healthy public opinion on the subject of labor… and the justice of its receiving a full, just share of the values … it has created." For three years the Order was a garment-cutters' club, its membership remaining less than one hundred. 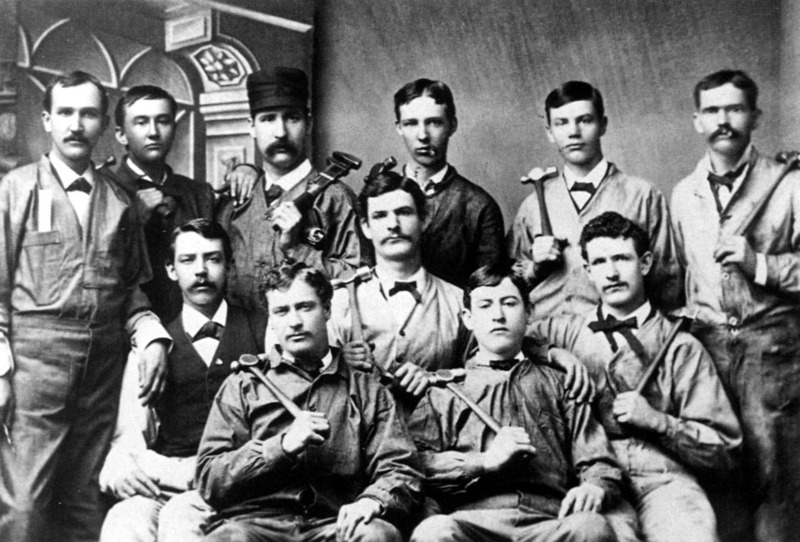 In 1872, several ship-carpenters, plumbers, and other workmen were allowed to join, and thereafter it expanded rapidly into a national organization. The secrecy and ceremonials appealed to the men, and within the lodges were numerous official positions with magnificent titles and uniforms. Grand Master Workman Stephens - for such was his title - declaimed sonorously about "justice," "the nobility and dignity of labor," "the great brotherhood of toil," and hinted at the evil doings of the capitalists. But his successor, Terence V. Powderly, a machinist by trade, who was elected Grand Master Workman in 1878, cut a still more absurd figure in the national labor movement. He excelled even Stephens in vague social idealism, love of abstract words, and bombastic oratory. A windbag, a figure of lath and plaster, vain and jealous, loving power, never knowing his own mind, he was blown hither and thither by the force of events. He had an expansive manner and held that "labor was noble and holy," was opposed to "wage slavery," as he boldly called it, but looked with deep disfavor upon the strike as a method to fight it. His ignorance of the forces inherent in modern industrialism was abysmal. He spoke grandiosely on all sorts of subjects, night and day. The man was full of strivings and gropings, a valorous idealist on the platform, but timorous when action was suggested. The K. of L. was essentially an assembly of windbags, full of half-hearted revolutionary impulses and crude chicane, affording men, like Stephens and Powderly, who loved to hear themselves talk, an opportunity to orate and receive the applause of simple workmen, in whose capacity to help themselves as a class they had no intelligent faith. Nearly everything that the K. of L. achieved in the course of its dramatic career was achieved in spite of its leaders. During Stephens's regime the order was entirely secret; not even its name was known to outsiders. Its meeting-halls and gathering places in the forests, and its official announcements in the press were indicated, romantically, by five stars (*****). People would see the mark appear on the door of some auditorium and then hordes of workmen would come flocking there. What were they up to? How strong was this mysterious Order of the Five Stars? The conservative, respectable mob, to say nothing of the capitalists, made uneasy by the upheavals of the proletariat in Paris and their famous Commune of 1871, by the Molly Maguire disclosures, and by the riots of 1877, feared that the organization might be dangerous. Suddenly some fateful day a bloody terror might burst upon the country! Finally, the press and the pulpit began to demand that the ***** come out in the open and announce their aims. Powderly was a politician, a self-seeking, self-conscious public character, sensitive to public opinion. So, in 1878, under his leadership, the order complied with the demand, and the public was informed that the K. of L. were eager to "enjoy the blessings of life" and that their battle-cry was "Moral worth, not wealth, is the true standard of individual and national greatness." Powderly spoke pretentiously of "uplift" … "ideals" … "principles." Notwithstanding Powderly's and his cronies' opposition to strikes as a means of gaining for labor a greater share of industrial profits, numerous walkouts, big and small, occurred the country over, commencing in 1880, when conditions began slowly to improve after the dire effects of the panic. The K. of L. leaders, so-called, were forced to make concessions to strong elements within the order which insisted upon action. Most of the K. of L. strikes, however, as well as others at that period, were unsuccessful because dishonestly or incompetently led. A typical K. of L. strike in the early years of Powderly's regime was that of the telegraphers, in 1883. They had organized nationally and become affiliated with the K. of L. the year before. The impulse for the movement came from below, strong enough to overcome the objections of the timorous general officers, conscious of their inadequacy. The walkout occurred on June 19 against all commercial telegraph companies, of which Jay Gould's Western Union, employing some 4000 operators, was the greatest. The men demanded one day off in seven, an eight-hour day shift and seven-hour night shift, and a raise in wages. The strike was a national affair, a topic on the floor of the United States Senate. Jay Gould was just then in deep disfavor with the public for his over-contemptuous attitude toward it, and a large portion of the press gave its support to the strikers, not with any real feeling for the justice of their cause, but rather to cater to a public prejudice. The country was once more reminded of the existence of the labor problem. But the blacklist was already a well developed method of the capitalists to subdue the workers. In this instance, the Western Union and other companies employed the mere threat of it successfully. Frightened, one by one, the strikers returned to work on the old terms, and by the end of July the strike was a dead failure. There had been no leadership, no discipline, no adequate strike fund. In the early and middle eighties there were numerous minor disturbances all over the country, for the most part spontaneous outbursts of badly organized, practically leaderIess workers. Yet, in the midst of all the failure, there appeared occasional signs that by and by organized labor might become effective. Of the few successful strikes, the most notable were the K. of L. railroad strikes in 1885. On February 16 of that year, Jay Gould's Wabash road announced a ten per cent cut in the wages of its shop men. Other Gould companies had preceded the Wabash with similar announcements. Within two weeks, close to 5000 shopmen struck on three Gould lines. The engineers, brakemen, firemen, and conductors declared themselves in sympathy with the walkout and seemed ready to translate their sympathy into action. The wage cut did not go into effect; the men won the strike. The following summer, however, the Wabash discharged a large force of K. of L. shop men, which amounted practically to a lockout, in direct violation of the agreement that had ended the strike in the spring. The K. of L. then ordered a boycott of the Wabash rolling stock, which, had it been put into effect, would have disorganized over 20,000 miles of railways. The boycott was by this time an effective weapon in the hands of labor to which even the K. of L. uplifters did not object very strenuously. Jay Gould took alarm; the terrible riots of 1877 were still fresh in his mind. Before matters had gone much further, he hastily invited the K. of L. railwaymen's leaders to a conference with the managers of his roads, at which he lent his influence in favor of yielding to the unions. The unions recalled the boycott order, and in the final settlement the Wabash made several concessions to them. It is not long since William H. Vanderbilt dismissed a reference to the will of the people with a profane sneer which showed his utter contempt of the people's rights. Now one whose power in the railroad world is only second to that of Vanderbilt finds that today the demands of his laborers cannot be dismissed that way. There was something intensely dramatic and spectacular in this first important labor victory. Immediately after it, there began a veritable stampede of the loose laboring masses to join the K. of L. unions. The membership of the order increased so rapidly that the general officers, fearful lest the organization should become so huge as to be utterly unmanageable, began to refuse charters to new locals. Among the new members were tens of thousands of unskilled and foreign-born laborers. The press of the country, both labor and conservative, helped blindly to exaggerate the significance of the victory, little dreaming that within a year it would lead to troubles almost as great as, and more significant than, those of 1877. This text has been excerpted, and very slightly edited by libcom.org to make sense as a stand-alone text, from Louis Adamic's excellent book, Dynamite: the story of class violence in America.